ReclaiMe Pro is equipped with professional partition recovery capability designed to search for lost and damaged partitions from various filesystems such as FAT, exFAT, NTFS, EXT, XFS, and VMFS. ReclaiMe Pro (download) starts to read partitions immediately after launching. The software searches all the connected devices for the partitions you specified in the Disk and image scan options window. When reading, it looks for only healthy or slightly damaged partitioning metadata such as regular partition tables (GPT, MBR, and APM) or md-raid superblocks. In ReclaiMe Pro, you can specify the desired partition schemes to reduce the recovery time. For more information please refer to the partition schemes page. For more thorough partition search use the Find Partitions feature of ReclaiMe Pro which is available in the Disk and partition list window. To recover partitions using this feature, you need to select a device from the list and click the Find partitions button on the right. 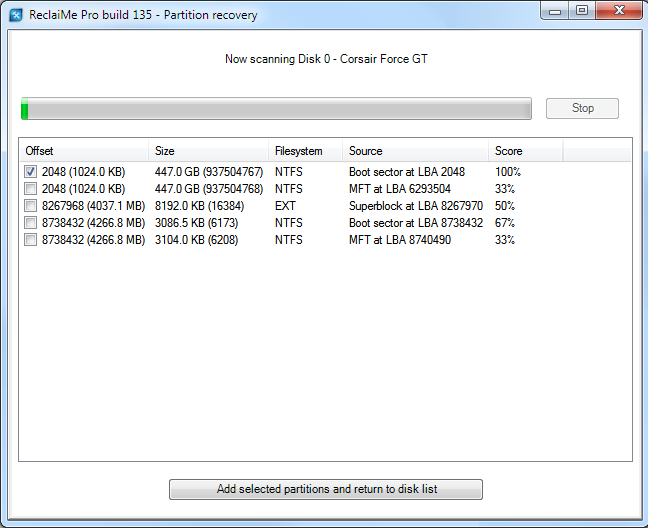 ReclaiMe Pro switches to the partition scan mode where you see a list of found partitions and a progress bar. For each partition found, its start offset, size, filesystem, and Score are provided. The Score indicates how ReclaiMe Pro is confident about a particular found partition. In the Source column, you can find information about a filesystem based on which ReclaiMe Pro identified the corresponding partition. Once you are satisfied with the partition recovery result, click Stop, select all the recovered partitions you need, and click Add selected partitions and return to disk list. This brings you back to the list of devices where you can select the needed partition for further data recovery. You may find useful to watch our data recovery video devoted to partition recovery in ReclaiMe Pro. Partition recovery is based on ReclaiMe Pro’s ability to recognize certain structures indicating that a particular partition existed on the device. Each filesystem is characterized by its own set of such structures, that’s why Score is calculated differently depending on the filesystem type. Second FAT table, LBA is taken from boot sector. For FAT16, our partition recovery software uses three Score values. Score 100% is set if FAT16 boot sector was found and both FAT tables were validated. Score 67% is assigned if ReclaiMe Pro found FAT16 boot sector but one of the FAT tables found was incorrect. Score 33% indicates that valid FAT16 boot sector was found but no FAT tables were found at their expected locations. For each recovered FAT32 partition, ReclaiMe Pro uses two Score values. Score 100% is set when all the above structures were validated. Score 75% is assigned if FAT32 boot sector and any two structures, for example two FAT tables, were found and validated. FAT table, LBA is taken from the exFAT boot sector. For recovered exFAT partitions, ReclaiMe Pro uses three Score values. Score 100% is set when all three structures were found and validated. Score 67% is assigned if any two structures were found and validated. Score 33% means that either exFAT boot sector or exFAT backup boot sector was detected while FAT table was not found. There are four structures based on which ReclaiMe Pro partition recovery engine calculates Score for the recovered NTFS partitions. ReclaiMe Pro partition recovery program can assign three possible Score values for the found NTFS partition. Score 100% means that all four structures were validated. Score 67% is set when only one structure was not validated (for example, there is a damaged boot sector on the device while backup boot and both MFT are valid). Score 33% is assigned if only two structures of four possible were found. For recovered EXT and XFS partitions, Score is calculated as the ratio of the number of valid superblocks to the expected number of superblocks written in the first superblock found. ReclaiMe Pro displays only those partitions which have higher than 20% Score. For HFS+ partition recovery, ReclaiMe Pro uses only 100% Score which is assigned to the par­ti­tions for which both volume headers were validated. In VMFS partitions, separate extents are identified, including those not containing any partition metadata. Only 0% vs. 100% scoring is available, since there may be no metadata to validate extent parameters against. For each extent, the range of addresses inside the volume covered by this extent is provided to allow for manual reconstruction of the whole volume. More details are available here. Search for these par­ti­tions is not supported.